Young adults seek new forms of Christian education. subscribe or read more articles from this issue, go to www.pcusa.org/today. Battered by a constant torrent of news stories, online media, and social networking feeds, millennials have grown up with a “super highway” of information. They also are on track to be the most educated generation in history. Millennials no longer need (or believe they need) experts—including those in the church—to pass information from on high. They can listen to a TED talk for cutting-edge information on a wide variety of topics. Christian education, therefore, has to offer something that no YouTube video can: whole-life transformation. Regrettably, many congregations continue to employ the traditional Sunday school model—designed to transmit information that millennials no longer seek. Maybe it’s not incidental that many congregations are experiencing declining participation, especially among millennials and their children. The Sunday school model may no longer be the most effective way to reach young people in the United States. Here’s why. In many congregations, Sunday school is the main opportunity, aside from worship, to share faith with adults and children. Congregations spend a great deal of time, money, and energy on that hour, with the hope that their curriculum, volunteers, and excitement will convey all that anyone needs to know to live as a Christian. Decades ago, there was little need to learn how to apply faith in the surrounding culture, because everyone (at least outwardly) shared the faith. So, the church set aside a time for individuals to learn more about their tradition’s understanding of the Bible and doctrine. It used to be that children learned about Jesus at home and in public schools. Slowly, teaching about Jesus became less common in school and, sadly, at home. Many millennials would like to see that latter trend reversed. They seek training to be educators in their respective contexts. They don’t just want to be taught; they want to be taught to teach. Millennials want to be empowered to learn on their own and shepherd their children. “The Western church has more information about Jesus and the Bible and the church than we’ve ever had,” says BJ Woodworth, pastor of the Open Door, a missional Presbyterian worshiping community in Pittsburgh that consists largely of millennials and their children. “And yet we’re not seeing deep, soul-level transformation happening in people’s lives.” Millennials do not see the value in memorizing information that is available at their fingertips. Instead, they want to know why something matters and how it affects them and the world around them. It might be difficult for churches to break their Sunday school habit. The following examples, while not blueprints, may spark ideas for more effective models for millennials and their children. Nathan Van Patter, 26, attends the Upper Room, a PC(USA) church plant in Pittsburgh. Recently, he led a weekly Bible study on Mark with 8 to 10 other young adults. To put what they learned into action, the group brainstormed ways to bring Mark’s Gospel to bear in their community. Like many millennials, the group wanted to connect the study with their everyday lives in a truly meaningful way. They wanted the group to become a place where they could be Christians together and make an impact in their community. This shows that educational endeavors within the church must convey meaning or impact. Millennials have little interest in programs that seem to have no effect on God’s kingdom. In addition to keeping the Sabbath, everyone is challenged to do the following each week: set aside one time of silence to listen to God; read Scripture at least once; eat with at least two people with whom they do not live; encourage two people through words, gifts, or actions; and look for ways to give time, money, and skills to others. The community also is committed to being intergenerational in worship and does not emphasize specialized children’s programs. “The less program-dependent we are, the more moms and dads can raise their kids in the way of the Lord,” Woodworth says. Millennials are accustomed to educational experiences that are interactive, and they expect similar spiritual experiences. Rodger Nishioka, associate professor of Christian education at Columbia Theological Seminary in Decatur, Georgia, says millennials connect their experiences of God with times when more than one sense is engaged. In the past, he says, we knew God “by just having someone tell us about God. Well, I don’t think that’s how it works anymore. . . . Congregations have to be thinking about an experience.” Nishioka recalled a time when a student at Columbia preached on the potter and the clay. The student placed a pottery wheel in the chapel and threw a pot while she preached. Congregations need not be so creative. A simple recovery of regular celebration of the sacraments may be all that millennials need to engage their senses in worship. But for those congregations looking to be creative, options abound: think about ways to incorporate tastes and scents into a lesson; invite questions after a sermon (either voiced publicly or tweeted); encourage movement in worship; incorporate ancient or cross-cultural contemplative practices or liturgies that include silence; or structure a class to be a conversation rather than a lecture. Taking even small steps away from the traditional Sunday school model may be met with resistance. It might help to remind the congregation about what must never change. “What shouldn’t change? Jesus Christ as the center. No question,” Nishioka says. “We are the church of Jesus Christ. That’s who we are. Christ is the same yesterday, today, and tomorrow, thanks be to God. I actually laughed when I was asked to reflect on one thing I wish I had learned in seminary after nearly a year in ministry. A friend’s response to hearing about this prompt was, “One thing? Can it be ten?” Truthfully, I have encountered more things than I can count in my first year of ministry that seminary did not prepare me for. It would be easy to write a laundry list of how I wish seminary had taught me to navigate the world of church insurance, had given me better tools to reach out to congregants with dementia, had trained me on how to lead people into healthy conversations about money; how I wish I had learned in seminary just how much time I would spend answering emails, sitting in meetings, dealing with administrative tasks, and just how rare actual theological conversations would be. At the end of the day, though, seminary is not really there to teach us those things in the first place. I think I knew that, but I wish I had appreciated it. I also wish I had appreciated the fact that the things I was taught in seminary were only seeds that still need a lot of time and space and nurturing to grow. Seminary taught me how to think differently. It opened my mind to new ideas, new concepts, whole new worlds of thought. It gave me a new perspective, a new language, lots of new vocabulary. Seminary taught me more than I could have ever imagined, and I loved (almost) every minute of it, but it did not – and could not – really, truly, practically prepare me for what being in ministry looks like. I wish I had appreciated sooner that even though I may be a Teaching Elder, I need my congregation and my context to teach me about theology, about church history, about pastoral care, too. I learned in seminary about the dynamics of “family churches,” but I was not at all prepared for what that actually meant until I saw my congregation pull together to support, defend, or care for one another. We talk so much about the importance of hospitality, but I hear that word with new ears after going weeks without buying produce as bags and bags of vegetables kept appearing on my doorstep. I certainly thought I understood the concept of grace after three years of seminary, but that idea, too, has taken on new life for me after a year that has certainly not been mistake-free. There certainly have been days in the past year of my life when being unprepared feels like it is par for the course. There are days when it is easy to say about so many things, “Why didn’t we learn this in seminary? !” There are also days, though, when I hear echoes of lectures, of discussions, of conversations from classes that can feel a world away and think, “Oh, that’s what that meant,” and realize again that seminary was only the beginning, that I was not supposed to learn everything there, that God is still working through all the people and situations and circumstances around me to continue that growth. Even though I only started ministry in October 2013 and am very new to ordained ministry, I have already been greatly enriched, encouraged, challenged, stretched, discouraged, blessed, and baffled by God’s abundant grace. I loved my time at Pittsburgh Theological Seminary and believe my time began to prepare me for ministry. I say “began” because ministry is truly a unique calling where something new is learned every day. Therefore, narrowing down what I wish I would have been told or learned to better prepare me for ministry is difficult. Ministry really does require life-long learning. Theology books should not be closed and packed away after graduation. Keep a collective list of all books (including non-theology books) you have read and a brief summary. You would be surprised with how helpful this can be for sermon preparation. Try to learn something new daily. 1) C.P.E-Even if you are not required to do a unit; do one anyway. Yes, I truly believe lots of pastoral care skills can only really be learned in the field. I do think it is possible to be a pastoral leader without having a C.P.E unit. However, chances are as you visit parishioners in their homes or hospitals you will not have the chance to reflect theologically with either your senior pastor or others. It is a benefit I wish I had after driving home from the nursing home to visit an elderly and lonely parishioner. I am currently looking into using continuing education to complete a unit of congregational C.P.E, but while you are in seminary go ahead and do C.P.E. 2) Administrative/ business type tasks– Administrative tasks also vary from day to day. Be prepared for anything and everything. I have done lots various tasks that end with me laughing and saying “I didn’t learn this in seminary!” Also, I am not great with numbers and I wish someone would have suggested to take a class which teaches administrative, budgets, numbers, how to run a business, etc. 3) Estimated Taxes– Check and see if there are any withholdings from your check and ask if you are not sure. Please do yourselves a favor and learn about estimated taxes. I am grateful my senior pastor filled me in on the process but I have had friends who went a while without budgeting for estimated quarterly taxes who ended up owing tons of money to the Federal and State governments. I’m sure if asked in another month or day, I would have more to add to this list. But above all, remember to rely on our Lord, who created, called, and sustains us. Remember the words of 1 Thessalonians 5:16-18, “Rejoice always, pray without ceasing, give thanks in all circumstances; for this is the will of God in Christ Jesus for you.” Maybe even post these verses somewhere in your future offices or work spaces and read them whenever you face trials. Written by The Rev. 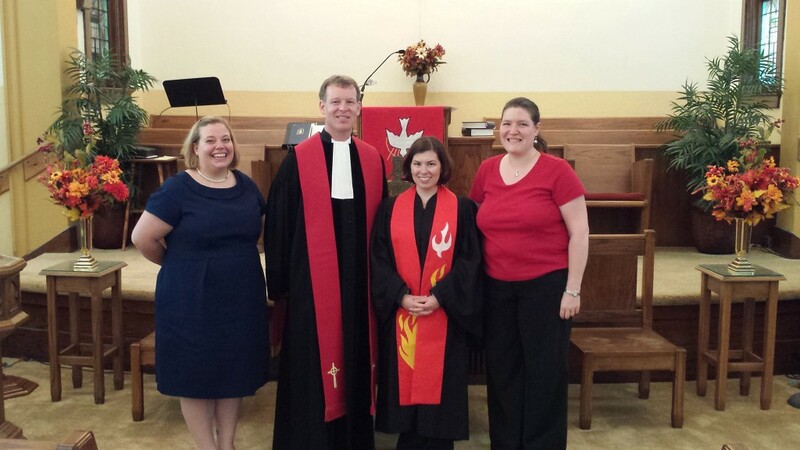 Amanda Maguire ’13, Associate Pastor at Graham Presbyterian Church in Graham, NC.